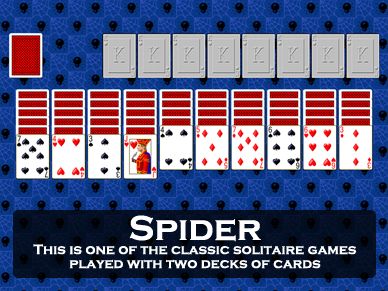 Screen shot of the game Tarantella from Pretty Good Solitaire. 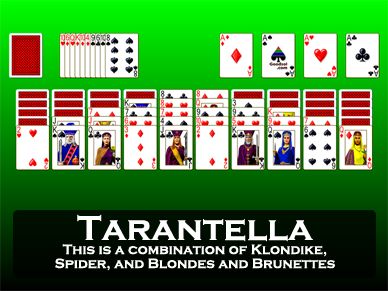 Tarantella is a two deck original solitaire game invented by Thomas Warfield. There are ten tableau piles. At the start of the game 5 cards are dealt to each pile, in the first and 10th piles, the top card is face up, in the 2nd and 9th piles 2 cards are face up, in the 3rd and 8th piles 3 cards are face up, in the 4th and 7th piles 4 cards are face up, and in the 5th and 6th piles all the cards are face up. The tableau piles are built down by alternate color, wrapping from Ace to King as necessary. Groups of cards in sequence down by alternate color may be moved as a unit. 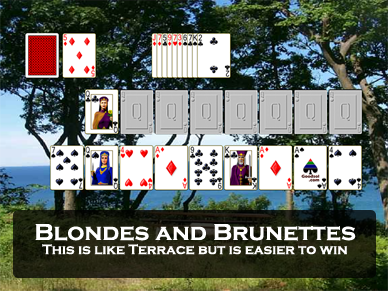 Spaces may be filled by any card or legal sequence of cards. There are only 4 foundation piles. They are built up in color from Ace to King, back to Ace to King again, until each pile contains 26 cards. At the start of the game an Ace of each suit is dealt to each foundation pile. There is a reserve pile located at the top of the layout. 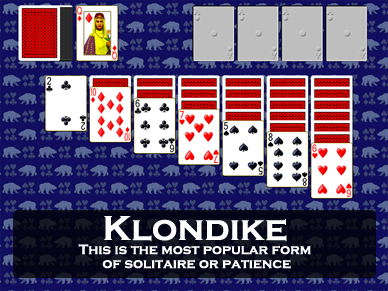 The top card is available for play on the foundations or tableau. At the start of the game 10 cards are dealt to this pile. The remainder of the cards are dealt face down to the stock. When play comes to a standstill, clicking on the stock deals one card to each tableau pile. There is no redeal. An average player can win Tarantella about 90% of time. However, nearly every position is winnable, so scores of 100% are quite possible. 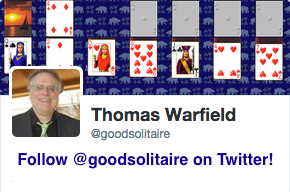 Tarantella was invented by Thomas Warfield and is one of the 850 games in Pretty Good Solitaire and one of the 101 games in Goodsol Solitaire 101. 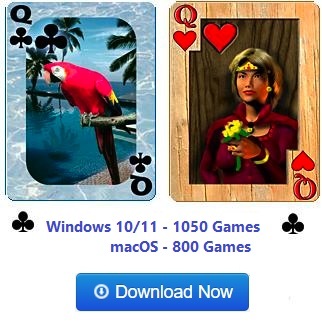 Download the free 30 day trial of Pretty Good Solitaire, the world's biggest solitaire collection with full undo, large card sizes, and easy offline play.